Annual Dues are only $15.00 for one year or only $25.00 for two years & receive your Electronic Version of the Crest & Wings Newsletter by Email. If you would like to receive the printed version of the Crest & Wings Newsletter by mail, your dues are only $30.00 per year to offset the cost of printing & postage. Cadillac & LaSalle Club, Inc. is a prerequisite. You must have Adobe Acrobat Reader to view & print these forms. Entering your email address when making your purchase will allow us to contact you for any additional information. New & Renewal members realize that their auto(s) must be insured and that members cannot hold the CLC SoCal Club responsible for accidents or damage in connection with Club activities. Members also realize that they cannot hold the CLC SoCal Club or its Board liable in any way for any disappointments or problems arising out of doing business with any of the businesses listed in the Club’s Vendors, Mechanics and Crafts Directory. 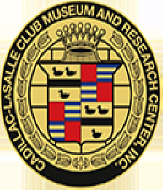 In addition, members understand that to be a member of the CLC SoCal Club, members must also be a member in good standing of the National Cadillac & LaSalle Club. Note: Members everywhere are advised that CLC fender covers remain available from the SoCal Region. Although not often advertised, this is an open-ended project and the covers may be ordered anytime ($30.00 each or two for $50.00 post paid--available in red or blue). These deluxe, oversized, silk screened fender covers provide maximum protection for the extra long fenders on 1940s thru 1970s Cadillacs. Click here to Check them out!